After a prolonged period of decline, 2018 monsoon season brings significantly higher than average wind speeds across India. 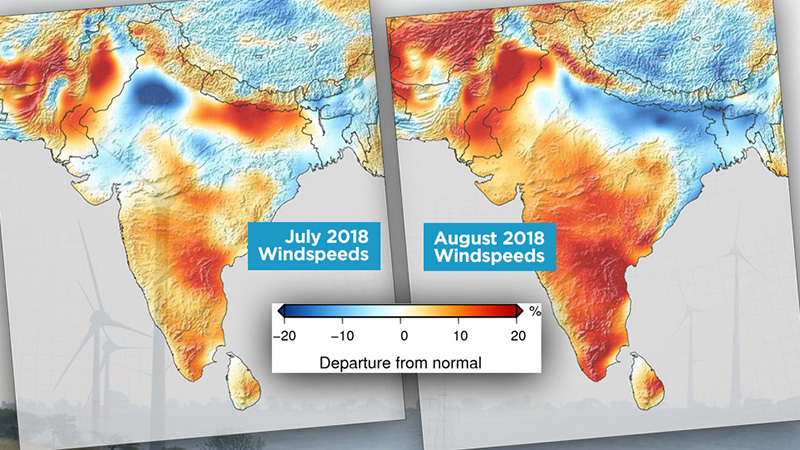 Wind speeds in India during the 2018 monsoon season were significantly higher than normal, and up to 20% higher than long-term averages in some regions, according to wind performance maps Vaisala published today. These higher wind speeds will benefit wind farm production; this is welcome news for wind energy operators and investors, who have faced several years of lower-than-normal wind energy production during the monsoon period. Because the monsoon season typically has the highest wind speeds of the year, the below-average wind resource in recent years has had a disproportionate impact on wind energy production and has caused concern in the sector. In contrast to recent years, Vaisala's measurements and analysis of the monsoon season show that wind speeds across India were up to 20% higher than the long-term average for periods of July, August and September - with notably strong performance in key wind power producing states, Tamil Nadu and Andhra Pradesh. The increase runs counter to an observable trend over the past 20 years of declining wind speeds, and stands in sharp contrast to resource data from the monsoon season in three of the past four years, which shows that wind speeds dropped well below the historic average. This recent change in fortune will be welcomed by renewable energy investors in India and may help adjust perceptions of wind sector underperformance at a time when many energy assets are under scrutiny by lenders. Investment in the renewables sector has slowed following the recent cancellation of several large wind and solar tenders where the bids did not achieve the benchmark ceiling tariff. While this year's monsoon wind performance was good news for power producers, wind energy developers must still find a way to demonstrate the value of investment in their wind projects, faced with long-term variability in wind speeds. Key to this is a scientific, data-driven approach to wind resource assessment. "Improved resource performance over this past monsoon season, when set in the right context, can show investors the sector has real potential, and should signal a boost to investor confidence in India's wind industry," said Rajnikanth Umakanthan, Managing Director of 3TIER India, a Vaisala subsidiary. "The variability we see in resource performance underlines the value of using a long-term climate context when performing wind resource analysis. Currently, financial performance is judged against ever-lower tariffs - even in less windy states - so it is important to contextualise that with a longer-term view of climate effects." For more information about Vaisala's Wind Energy due diligence services, visit our website. For information about worldwide wind anomalies for the past 35 years, access the Vaisala Climate Reference Tool. Vaisala is a global leader in environmental and industrial measurement. Building on over 80 years of experience, Vaisala provides observations for a better world. We are a reliable partner for customers around the world, offering a comprehensive range of innovative observation and measurement products and services. Headquartered in Finland, Vaisala employs approximately 1,600 professionals worldwide and is listed on the Nasdaq Helsinki stock exchange.